A kitchen renovation and a modern addition for an 1896 single-family brick rowhouse. The addition includes a first-floor fireplace surrounded by sitting and dining areas, a second-floor bedroom suite, passive solar heating, and concrete floors with radiant heating. A new 900-sf single-family house in rural Michigan. The site abuts a national park, and the house is designed primarily for outdoor living, with an expansive deck connecting two living pods. This energy-efficient house is tightly constructed, well-insulated, and uses a wood-burning stove as the main heat source. This was a true collaboration with the owners, who came to us with strong design ideas that meshed with our own principles of compactness, energy efficiency, honesty of materials, and modern aesthetics. This 3,200-sf farmhouse in the Catskill Mountains outside of New York City was renovated and modernized. There is a new kitchen, new interior finishes, and a new second-floor master suite. We opened up the first floor plan and added a new deck to expand the living and entertaining space outward and unblock the views of creek-fed ponds, forests, and hills beyond. 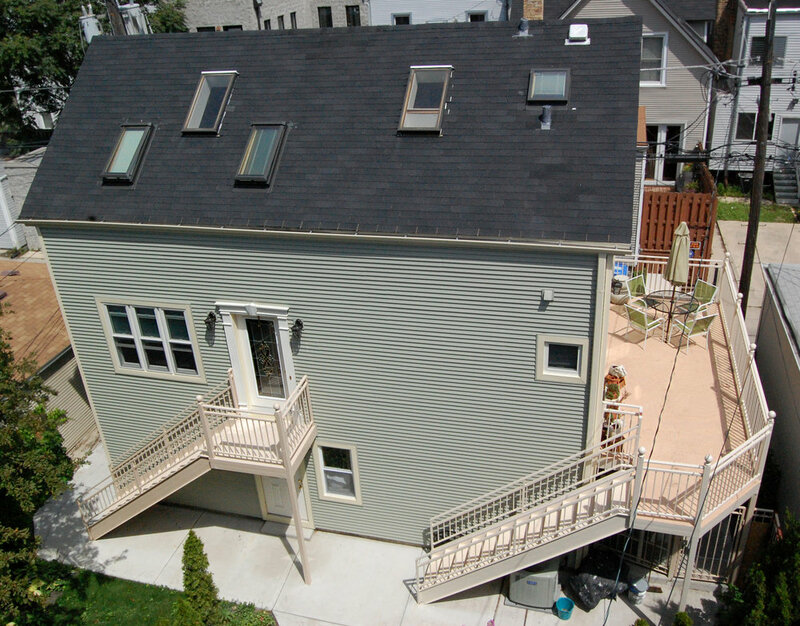 We sealed and insulated the exterior for comfortable, year-round living. We renovated an attic with the goal of creating a light, airy, comfortable space for a writer’s studio. We added skylights, built-in shelving, and a bathroom. We winterized and modernized the space while respecting the Victorian roots of the house. An extensive renovation of a 1920s three-bedroom house. 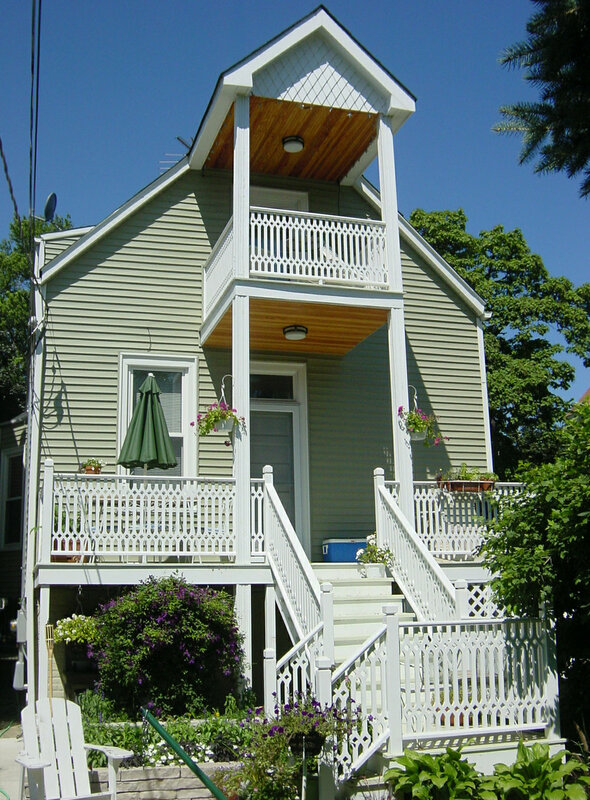 A compact addition replaced an old enclosed porch and added space for a master bedroom suite. Separate kitchen, dining and sitting areas were combined into an open, flowing space. This extensive renovation of a 1920s four-bedroom house included adding a new kitchen, deck, master bedroom suite, and attic bedroom suite. Gut renovation of a late-1800s coach house residence. We added a new deck for outdoor living, and the building was raised to provide new ground-level parking. We designed a 2nd-floor addition for this one-story 1960s weekend house on Lake Michigan, including a wall of windows that faces the lake and opens onto an expansive balcony. On the first floor we remodeled the kitchen and redesigned the fireplace. 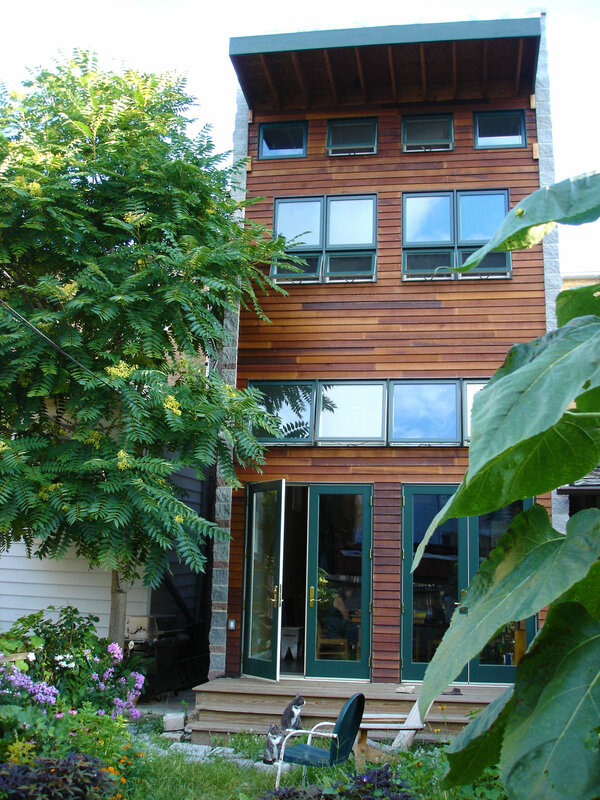 This gut renovation of a late-1920s 4-square frame residence modernized the electrical and heating systems and weatherized the building envelope for improved energy efficiency. We added a new kitchen, attic bedroom suite, and master bedroom suite. This 1850s Federal-style house is the oldest house in Evanston. We rebuilt a portion of the second floor to provide acceptable ceiling heights and create two bedrooms out of one. The design was a contextual response, and needed approval by a review committee due to the historic nature of the original house. We have renovated and redesigned many porches and decks to conform to current building code requirements and satisfy the owner’s expectations of aesthetics and function. This work is often associated with a larger renovation project.